Citation Information: J Clin Invest. 2013;123(11):4654-4666. https://doi.org/10.1172/JCI70160. Background. By the year 2030, 3.48 million older U.S. adults are projected to undergo total knee arthroplasty (TKA). Following this surgery, considerable muscle atrophy occurs, resulting in decreased strength and impaired functional mobility. Essential amino acids (EAAs) have been shown to attenuate muscle loss during periods of reduced activity and may be beneficial for TKA patients. Methods. 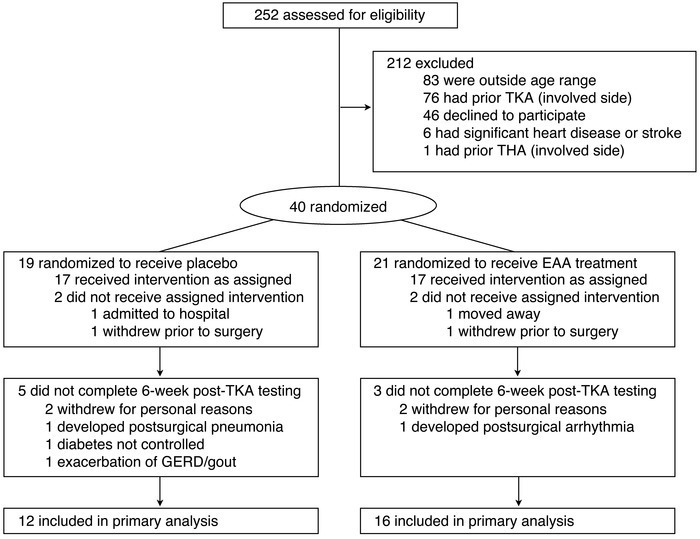 We used a double-blind, placebo-controlled, randomized clinical trial with 28 older adults undergoing TKA. Patients were randomized to ingest either 20 g of EAAs (n = 16) or placebo (n = 12) twice daily between meals for 1 week before and 2 weeks after TKA. At baseline, 2 weeks, and 6 weeks after TKA, an MRI was performed to determine mid-thigh muscle and adipose tissue volume. Muscle strength and functional mobility were also measured at these times. Results. TKA patients receiving placebo exhibited greater quadriceps muscle atrophy, with a –14.3 ± 3.6% change from baseline to 2 weeks after surgery compared with –3.4 ± 3.1% for the EAA group (F = 5.16, P = 0.036) and a –18.4 ± 2.3% change from baseline to 6 weeks after surgery for placebo versus –6.2 ± 2.2% for the EAA group (F = 14.14, P = 0.001). EAAs also attenuated atrophy in the nonoperated quadriceps and in the hamstring and adductor muscles of both extremities. The EAA group performed better at 2 and 6 weeks after surgery on functional mobility tests (all P < 0.05). Change in quadriceps muscle atrophy was significantly associated with change in functional mobility (F = 5.78, P = 0.021). Conclusion. EAA treatment attenuated muscle atrophy and accelerated the return of functional mobility in older adults following TKA. Funding. Eunice Kennedy Shriver National Institute of Child Health and Human Development (NICHD), Office of the Director (OD), and the National Institutes of Health Office of Dietary Supplements (ODS), NIH grant K01HD057332, and the Medical Research Foundation, Oregon Health and Science University. The funders had no role in study design, data collection and analysis, decision to publish, or preparation of the manuscript. The content of this manuscript is solely the responsibility of the authors and does not necessarily represent the official views of the funders. Random assignments to treatment group, reasons for exclusion and withdrawal, and study completion.